A bright, high cloud at the terminator that a few lucky observers caught and that got even professional planetologists excited, a bright splotch on the big dark Mare Acidalium and numerous other clouds have been sighted on Mars in recent weeks - if your equipment's resolution was good enough for seeing detail on the tiny disk. The terminator cloud was observed e.g. several times by Wayne Jaeschke (see e.g. this, this and this report) and is covered here, here, here (proposed explanation; earlier), here and here. The Acidalium spot can be seen on many images, including some of those from March 28, March 25 (more), March 24 (more, more), March 22 (more), March 21 (more), March 19 (more), March 18, March 16 (more, more), March 15, March 14-15, March 14 and March 11-12. • The Venus/Jupiter conjunction is over (as a picture from this evening clearly shows): help yourself to many more pictures of March 24 to 28 and March 13 to 25 when they were closer and the Moon nearby, too. In the world of comets the new and unusual SWAN Kreutz comet didn't survive the solar passage: STEREO, SOHO C2 (more and more) and LASCO C3 imagery, coverage here, here (earlier), here and here and a possible ground-based detection on March 10. Plus how comets fare near the Sun (interview; earlier). • Comet Garradd's ion tail is coming and going: pictures of March 28, March 25, March 22, March 17, March 15 (more), March 13 and March 4. • Comet PanSTARRS is on track for a possible nice show in 2013. • Comets Gibbs & Lemmon (Gibbs again) and space weathering on Wild 2. • How the Halley meteoroid streams evolve under the influence of Jupiter (interview) and simulating the 2009 impact on Jupiter. • Another close asteroid fly-by by 2012 EG5 tomorrow (more) while Earth visitor (in 2013) 2012 DA14 got less interesting (related rant). Nice recent aurora images from March 20 (off Norway), March 18 (Canada), March 16 (plus 17 plus 20 off Norway), March 15 (USA, Norway, Germany [table, pictures, picture], the UK [more, more, more] and from a plane over the UK [more]), March 12 (Australia), March 11 (off Norway; more) and earlier in Norway and Alaska and here and there. Plus aurora science, a 2010 storm observed, space wx forecasting, SABER & storms (more), GIC modelling, possible space wx trends and weird claims re. health FX. • AR 1429 is back but largely gone though something was seen at the edge - during the 1st disk transit a lot more was there, including an M flare on March 13. • Also sunquakes after flares, the SDO seeing coronal cavities, a SDO movie of a "solar tornado" - and the solar diameter from a Mercury transit! 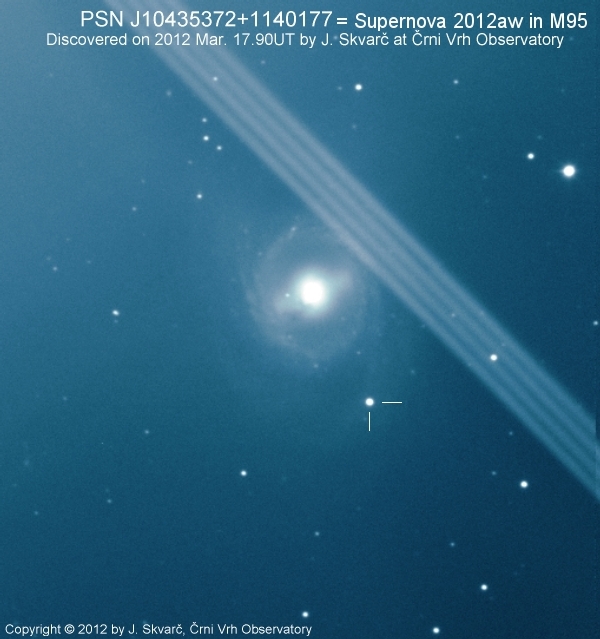 Elsewhere in the Universe SN 2012aw in M 95 (announcement, March 17 and 16 discovery images, a video about the early story and mehr, more, mehr, more, mehr, more, more, mehr, more, more, more, more, more, more, more, more, more, more and more) and SN 2012au in NGC 4790 (more, more, more and more). • NASA making 'chemtrails' for science of the thermosphere (timelapse sequence and another one). • Why spring came early. • And April won't bring much predictable, except for Venus in the Pleiades in the early days of the month (a March 28 view), the opposition of Saturn on April 15 and some Lyrid meteors later in the month.